After many years of prayer, training, education, spiritual formation and development, today we witness the fruition of that life of dedication, ending in the ordination to the Holy Priesthood of the fifth son of our parish! This young man knelt before the Holy Altar of God, and through the Ancient Rite of the Laying on of Hands of His Grace, Bishop Gregory of Nyssa, the God-Fearing Deacon Nathaniel Choma was Ordained to the Holy Priesthood! 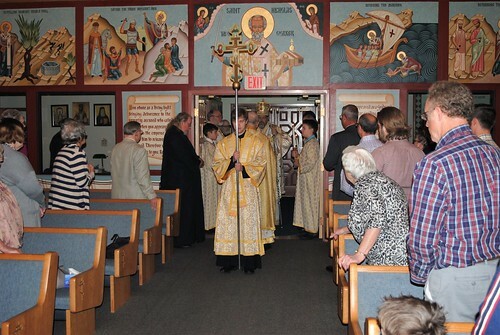 This having taken place in his home parish of St. Nicholas, where he was Baptised, raised, his priestly vocation encouraged and nurtured, before entering our Diocesan Seminary of Christ the Saviour. With tears in our eyes, and with swollen chests of pride, we cry out with one voice, Axios, Axios, Axios! You are Worthy! We pray that the Lord bless you, and strengthen you, granting you a fruitful ministry, as you labor tirelessly in His Holy Vineyard! May He Grant You Many Years!!! this wonderful Sacrament of Holy Orders, and as Family-in-Christ, see him ordained Priest! Following the Veneration of the Holy Cross and the distribution of the Antidoron, those who have made their reservations are invited to proceed to the Fellowship Hall, for the Grand Ordination Banquet that has been prepared, in honor of the new ordained priest, The Rev. Fr. Nathaniel Choma! Our good friends at De Lucia Restaurant, have prepared a delicious meal for everyone’s enjoyment! We look forward to the Christian fellowship to follow! At the conclusion of the banquet there will be a Free Will Offering collected. Your generous donations will be gracious accepted! There will be a short speaking program to follow. Afterwards there will be a reception line, at which time you will have the opportunity to extend your formal congratulations to Father Nathaniel and Pani Nicole Choma. We extend to them our love, our prayerful best wishes, and a request for a remembrance in their prayers as we remember them! Many Years! Namnohaja I blahaja Lita!